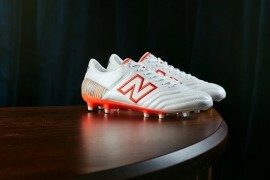 We don’t often don out anoraks and delve into the world of football boots-spotting here at Footy-Boots.com, so when we do we best make sure it’s worth while! There’s just something about Arsenal players and custom soleplates! With Captain Cesc Fabregas notorious for having the Tiempo Legend soleplate on his CTR360’s, it seems fellow midfielder Jack Wilshire has also followed suit; having a translucent plastic Tiempo sole added to the newest Nike CTR360 II colourway. Previously a Nike CTR360 II man, it was definitely a novelty to see Alex Song in the more-reserved new Nike Tiempo Legend IV‘s. Opting for the standard over the Elite version, the Cameroon international obviously wasn’t ready to move entirely away from KangaLite just yet. Spotted by Tariq on our Twitter page, we’ve got to give out man major props on seeing the Brazilian at all as he was barely on the pitch! Previously a Nike T90 Laser III man, we don’t think Denilson could have picked a pair of football boots further away from what he usually plays in! But regardless, the new Puma v1.11 look seriously good on the pitch! As arguably the first ever player to wear the Vapor VII‘s competitively whilst with on loan Feyenoord, it’s great to see the Japanese wonderkid still flying the Vapor flag! The left wing of both teams was the place to be watching as Miyaichi excited for the Gunners, whilst the lightning-fast Kunalan Subramaniam gave Arsenal plenty to worry about for a promising Malaysia XI. 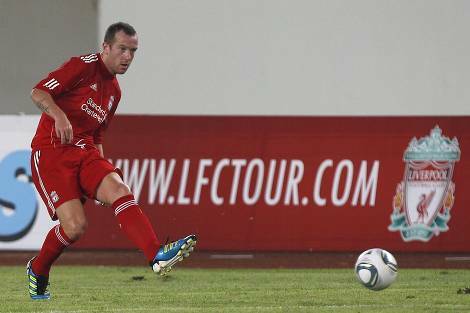 The Scot was thrown in at the deep-end for Liverpool in the first game of their pre-season tour of Asia in a seriously entertaining 4-3 matchup against Guangdong Sunray Cave. With the ink on his contract barely dry, the former Blackpool man slipped back into his new Predators (which he unceremoniously leaked on his Twitter page at the end of last season) to spray passes about the pitch, creating chances for Danial Pacheco, Maxi Rodriguez and Andy Carroll. England U-19 international Conor Coady was called upon to play alongside Adam in the absence of Gerrard, Meireles, Lucas and new signing Jordan Henderson. But despite his place in the Anfield pecking order, the native Liverpool lad laced up his Black/Lotus Umbro Stealth Pro II‘s (of which there are several fans in the Liverpool youth system) and excelled in the tough position, netting his first goal for the Reds after a good lay-off from Andy Carroll. Ever the workman of the Liverpool frontline, the Dutchman opted for something a little more spectacular in China yesterday with a Black/Sharp Blue/Electricity pair of adiPowers. Only one of a handful of Predator players to opt for this colourway, we think it’s a shame there’s not much on-pitch support for this version, as it looks excellent in action! 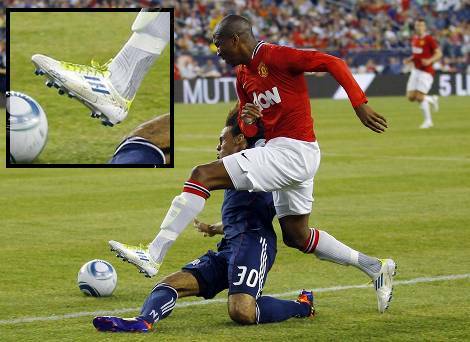 New signing Ashley Young was one of the stars of the show as the Premier League Champs ran out 4-1 winners over the MLS’s New England Revolution. Also at the centre of attention was Young’s choice of football boots! Not only did the winger opt for the seriously under-used White/Anodized Blue/Slime adiZeros, he also chose to play in the regular synthetic version, rather than the Primes – definitely an unusual choice from the former Villa man! 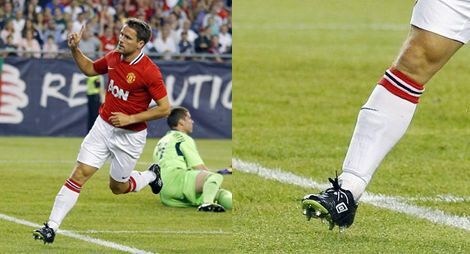 Getting his name on the scoresheet with a typically Michael Owen well-executed finish, the former Real Madrid man will have given Sir Alex something to think about with plenty of games to go in the pre-season. As far as we know, the Liverpool native is the first player to bring the new Black/White/Neon Umbro Speciali R to the pitch. Despite it’s classic upper, the Neon lime soleplate definitely brings this look of these football boots to life – here’s hoping we see them plenty more in the 2011-12 season! It was very much the Tiempo Show in New England as Ji-Sung Park bagged one in the new Nike Tiempo Legend IV Elite and Federico Macheda helped himself to a brace in the standard Legend IV’s. The Korean was very much a fan of the Elite Tiempo III’s last season, so it’s great to see him adopt the gorgeous new IV’s so early. It seems Nike’s newest football boots will get plenty of exposure during the Red Devil’s pre-season tour, as there’s no doubt that all eyes will be on which Tiempo’s Chicarito chooses to wear when he joins up with his team-mates in a few week’s time. We’d have loved to feature more of the Malaysian and Chinese players in this edition, as there were some truly great football boots to be spotted including the new PowerCat Elektro, some classic v1.08 Gold/Blacks amongst others! Any more boot-spots we missed that you can add? The Malaysian player in Powercat Elektros was Fadhli Shas, while Mahali Jasuli wore Fluorescent Orange/Blue Aster Powercats. Aidil Zafuan played in the new White/Silver/Royal Blue Tiempo Legend IVs. All three are defenders for Malaysia.